Short ribs braised in wine is classic winter comfort food. Pick a day you're planning to hang around the house for several hours. There isn't that much work to do, but the first stint in the oven takes nearly an hour and the second, two and a half. Your main job will be to simply savor the aromas wafting out of your kitchen! Though you could eat the short ribs the same day you cook them, they are even better when made a day or two ahead. If you've ever had short ribs, you know they are like mini pot roasts of the most succulent sort! But (Isn't there always a but?) they are so meltingly tender and delicious after long, slow cooking because they have so much fat. But I do something about that at four different stages, so what you end up with is really quite good for you after all. Most recipes I've seen for braised short ribs just have you taking the short ribs out of the package, briefly browning them on the stove, popping them in the oven, and then serving them up after a mere skimming of the braising liquid. That just doesn't cut it with me! First, I trim off lots of the visible fat. Second, I put them in the oven for a long stretch of flavor-building browning, which produces lots of fat you can drain away. Third, after braising, I put the strained braising liquid in the refrigerator and let the fat rise to the top and solidify for easy removal. Fourth, I remove lots of fat while I'm separating the meat from the bones. I know it sounds like it, but it really isn't all that much work. And the end result is worth it. Especially when you're using really good short ribs like the organic grass-fed short ribs sent to me by Rocky Mountain Organic Meats, a company that incorporates environmentally friendly agriculture practices, healthy land stewardship and--most important to me--the ethical treatment of animals into their production of certified organic, grass-fed and grass-finished beef. 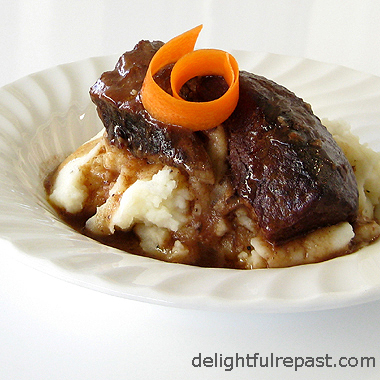 Short ribs are sometimes served on a bed of polenta or noodles, both delicious, but I prefer mine on a bed of creamy smooth mashed potatoes. Which do you prefer? Make day ahead so you can chill liquid and easily remove fat. 1 Preheat oven to 450 degrees. Arrange meat, fattest side down, in single layer in oiled roasting pan; season with 1/4 teaspoon salt and 1/2 teaspoon pepper. Roast 35 minutes; turn and continue roasting for 15 minutes, until very well browned. Note: You need a roasting pan that can be used on the stovetop as well as in the oven. After frustrating years of making do with cheapie roasting pans, when I finally invested in a "real" roasting pan, I never looked back. It's the Calphalon LRS1805P Stainless 16-Inch Roaster with Nonstick Roasting Rack, and it can do anything! 2 Transfer ribs to plate; set aside. Reduce oven temperature to 300 degrees. Pour off fat from roasting pan and place roasting pan over burner on medium heat; add wine and bring to simmer, scraping up browned bits. Set aside. 3 In 5-quart Dutch oven, heat oil. Add the onion, celery, and carrots to the pan and cook until soft, about 12 minutes. Stir in flour and cook for 1 minute. Stir in liquid from roasting pan, chicken broth, diced tomatoes,1/4 teaspoon salt and 1/2 teaspoon pepper, and seasonings. Bring to boil and add ribs, completely submerging in liquid; return to boil, cover pan with foil and lid and simmer in 300 oven for 2 1/2 hours. 4 Transfer ribs from pot to 2.5-quart oval Corning casserole. Strain braising liquid into 4-cup glass measure, pressing out liquid from solids; discard solids. Refrigerate for easy removal of fat. When ribs are cool enough to handle, separate the meat from the bones; discard bones. 5 Remove fat from sauce. Add water, if needed, to bring volume of sauce to 2 cups. Pour over ribs in casserole. Refrigerate until one hour before serving time. 6 One hour before serving, heat casserole at 300 degrees for 1 hour. Serve in shallow soup plate over mashed potatoes. Garnish with chopped flat-leaf parsley. I might prefer mine cooked by somebody else, too, but the dear husband is more of a quick stir-fry kind of cook, so all the time-consuming, multi-step stuff is up to me! 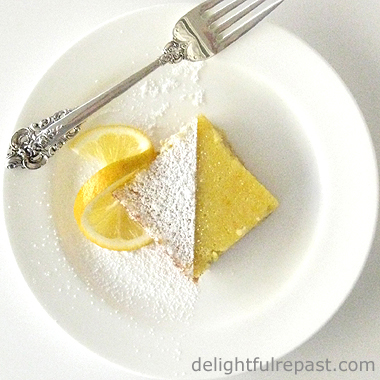 The recipe reads beautifully and the picture is gorgeous. I think I'll have to add this to my list of things to cook. As always, many thanks for the inspiration! Thank you, Mike! I always try to give very clear directions so that even someone who has never made a similar dish before can have a success. Thank you so much! Yes, "go out on a limb" and make this--you can do it, I know you can! Jean, another excellent recipe. You make it sound absolutely mouthwatering. However there is a line in your excellent description which set a few thoughts going. "the organic grass-fed short ribs sent to me by Rocky Mountain Organic Meats, a company that incorporates environmentally friendly agriculture....."
I am sure the product from this company is excellent and importantly, eco friendly. However, what does it cost? We live in straightened times and many have to tighten their financial belts. Sometimes fantastic recipes cost. What would be the budget version of this recipe for somebody trying to economise? Thanks, Tony. And you raise an important question. Each person has different priorities. I know people who would tell you they can't afford to buy the food that I typically buy, and yet they spend way more on clothes, for example, than I ever would. My thinking, when it comes to organic food, has long been that I can either pay more for the food now or more for the medical care later! That said, I suppose the budget version of this recipe would be conventional ingredients rather than organic. Another way I look at it--say the organic meat costs twice as much as conventional, then I would buy the organic and eat half as much. Ah you are presuming that everybody who reads your posts is middle class who ahve middel class occupations and middle calss incomes. Here in Britain we have unemployment which has reached 2 million which is about 3.3% of our population. I am not sure what percentage earn just the basic wage. There are a large part of our population who are retired. Perhaps the working population might be 20 million. They keep the economy going. But even the best paid occupations are reducing in number. I am lucky. I have three incomes!!! Ha! ha! Actually, four if I take into account my wife's well paid job.But I teach, sometimes, children from families where their parents are unemployed and it is not a choice between fine clothes and organic food, they have no choice whatsoever. I am sure you have the impoverished in the States too. Have you ever thought of writing recipes for them? Food is a very emotive and political subject you know, Jean. I am sure you and your loyal followers are aware of that. I do apologise, I am showing my left wing democratic socialist leanings!!! We British are awful!!!! Tony, no need to apologize. I too am concerned about world hunger and while it is a focus in my life, it is not the focus of my blog. Perhaps one day I can start a second blog. But, in the meantime, stay tuned for more "Delightful Repast - A Tradition of Good Food - Comfort Food with Flair." My wife and I went to the store to get the ingredients to make this beautiful looking dish for the Oscars tomorrow night but the meat was $8 a pound! We just can't afford $40 for the meat alone. Darn it! Maybe we'll have more money another time. Sure looks delicious! You are brilliant Jean. I love short ribs but dislike the fat, so this sounds like the perfect solution to the dilemma. I just happen to have short ribs in the freezer and will do a test run tomorrow - and let you know. Thanks so much for the great recipe and blog. Well done indeed! Richard, I don't blame you. Wait till they go on sale! Then let me know how the recipe worked for you. Laurel Ann, thank you! I'm so excited that you're going to try it out right away. Do let me know how they turn out. You will be amazed at the amount of fat you take out. Short Ribs you say? I'll have to look them out - I'm convinced that, despite what French people claim, we're missing out on meat cuts in this country. It's hard as anything to find a beef tenderloin, or even other cuts like silverside and so forth - They look fantastic though - great job! Thank you, Charles. I hope you can find the French equivalent. Perhaps if you got a French beef chart and a British beef chart and compared them, you could figure out what to ask for anyway. Looking at an American beef chart, I saw that short ribs come from the lower side, an area called the short plate (It was a while ago, I hope I have remembered that correctly!). Jean, first I love the techniques you've used to remove fat - I don't frequently cook meat (sticking mostly to poultry and fish) so it's nice to learn simple tricks for extracting unwanted fat. I made these last week, Jean! This was a big feat for me. I am a much better baker than a cook, and I don't often try anything new. But these really were easy and they came out soooo good. Thanks so much for the recipe and the encouragement! Ruth, I'm so glad the short ribs turned out well for you. And thank you for the award!